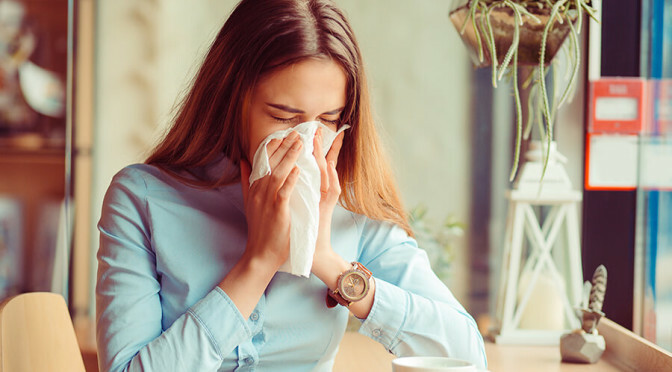 How fantastic is the warm weather, unfortunately, along with it, it brings the dreaded hayfever season in which everyone tries to avoid and reduce allergies desperately. It can be difficult to control your body’s allergies and keep them under wraps during this season. But there are a few precautions you can take in order to keep hayfever at bay. Hayfever is an allergy that can affect almost anyone, it affects millions of people across the world daily and often includes sneezing, puffy watering eyes, scratchy throat and blocked nose. Hayfever is triggered through dust and pollen in the atmosphere that then inflames the mucous membranes of your eyes and nose. There are plenty of over the counter medications which can help avoid hayfever and reduce the symptoms, but we’ve come up with a few alternative methods to do alongside this to really lower your chances of suffering from severe hayfever. So keep reading! One of the easiest ways to reduce your hayfever symptoms full stop is by using an air purifier. It also stops any pollen or dust inside your home, meaning that your home is a haven away from pollen. An air purifier works by taking all of the bad things out of the air in your home, meaning your home is cleaner and the air inside is 100% pure. Although you can have air purifiers fitted into your home, one of their main benefits is they require no installations and don’t require a lot of energy. You can purchase both fitted and free-standing plug-in air purifiers. Dogs and cats on their own can cause allergies, let alone when they have been outside rolling around in the grass. Animals such as dogs and cats naturally have allergens in their fur that can cause itchy watery eyes, sniffling and sneezing. So when your pets are outside playing it becomes extremely easy for pollen and other allergens to stick in their fur. Then when your pet comes inside and lays on the carpet or runs up the stairs, the pollen can fall out and contaminate your home. As well as this, when petting or cuddling your pets they can transfer any pollen or dust in their fur onto your hands and clothing, and if you rub your eyes or nose, this can trigger allergies or hayfever. So after your pets have been outside, be sure to bath them and to take great care that you continuously wash your own hands. You can purchase some shampoos that can reduce pet allergens; our favourite is the Pet+ Pet Shampoo . And like we previously mentioned, if you have pets and they roll around on your carpet, the pollen and dust in their coat is going to fall out and become stuck in your carpet fibres. By hoovering regularly, you get rid of the pollen before it has the chance to affect you. The same applies if you walk around your home in shoes that you have just worn outside. The pollen in the grip of your shoes can come loose and fall into your carpet. It is almost impossible to avoid pollen at all costs. If it doesn’t irritate your allergies straight away, it can stick to your hair which can then make its way onto your pillows and bedding. The only way to avoid this is by regularly changing your bed sheets, or purchasing hypo allergenic pillows. Although just a simple cold wash might not be enough to get out every single bit of pollen, which is why we recommend dry cleaners Bedford. Dry cleaning involves a process that allows you to get out almost anything, or you can opt for the kinder option of wet cleaning which is the same thing without all the harsh chemicals. As well as dry cleaning your bedsheets, we would also recommend that you dry clean your clothing to remove all pollen from them too. And of course, one way to stop summer allergies is by taking medication. Hayfever and allergy tablets are available over the counter in most drug stores, pharmacies and supermarkets. Meaning, if you ever run low, you can pop round the corner and grab some. Hayfever medication is available in a variety of different forms and can even be purchased in flavoured liquid form for younger children. Although, we must pre-warn you always to read the label on hayfever products. Simply because some of them can cause drowsiness, so you cannot drive or work if your job entails handling or operating heavy machinery. You can purchase liquid solutions, eye drops, nasal sprays and tablets forms of antihistamine to keep your hayfever at bay when you need it to. The first thing Brits want to do during the summer and heatwave is to go down to a pub garden – which is fine if you aren’t doing it all the time. You may not think anything of it, but our body produces histamine which is what causes us to have the allergic reaction to pollen. Alcohol, unfortunately, contains histamine itself, so if you’re sitting outside around flower and plants, you are already exposed to pollen. So when the histamine in your alcohol is combined with your hayfever symptoms, it can worsen them. So in order to avoid this, we would advise you either to enjoy your drink inside the pub away from any plants or pollen. Or just drink alcohol on the odd occasion, just don’t let hayfever ruin your time! By following these top tips, you can help keep hayfever at bay. Although we must say that it is extremely difficult, maybe even impossible for you to avoid hayfever entirely. But using these tips, you can dramatically decrease the severity of your symptoms, and how often your allergies flare up! If you need any dry cleaning, ironing Milton Keynes or general laundry services throughout the summer months – we are here to help! We hope that this article was helpful, if it was then why not share on social media?